The time between each frame is not known. Natalie Coughlin's time for this race was 1:00.37. This series is displayed along with one at 65 m so that a better understanding of what happens with both arms during Ms. Coughlin's pull is obtained. The stroke analyzed is very early in the race and might not be typical. Frame #1: The left arm enters straight while the right arm is completing the upward sculling phase to finish its pull. The swimmer could be flatter by pushing the head back further, which would result in the hips being higher and overall alignment being more streamlined. The angle of the spine in this position is approximately 20 degrees to the horizontal plane. Frame #2: The left arm begins to move outward and down. Drag turbulence is still largely on top of the arm. The left leg begins to kick to counterbalance the exiting right arm. Frame #3: The upper left arm abducts. The whole arm creates a drag surface with turbulence extending from the shoulder to the top of the hand. The swimmer continues with a body alignment that places the buttocks well below the torso. The left leg kicks vigorously to rotate the swimmer to the left. Frame #4: The left arm bends at the elbow as abduction pulls the arm past the swimmer. Considerable shoulder and torso rotation positions the arm advantageously. Frame #5: The left arm changes from abduction to adduction. Propulsion generated by the total arm can be seen clearly in this picture. The hips have rotated to the left to improve whole body alignment. Frame #6: The left arm continues to propel with substantial force (as judged by the size of the drag pocket). Frame #7: The left arm extends almost fully to place the hand at its greatest depth during the pull. The right arm has partially entered. This position displays exceptional shoulder flexibility in this swimmer. Frame #8: The left hand turns palm in ready to sweep upward and backward as part of the left arm exit. The right arm has entered with the back of the hand. The right leg kicks vigorously to assist body and hip rotation to the right. Frame #9: The left arm has swept upward with considerable vigor assisting the turning of the shoulders and torso to the right. The right arm is at full extension. Frame #10: The right shoulder is low and the elbow begins to bend. The hand faces backward. Frame #11: The right hand is pitched beyond vertical, the elbow bends, and abduction of the upper arm creates power for the movement. This is a good picture that illustrates how far behind the swimmer the propulsive movement begins. That starting position results in a very long effective propulsive phase in the stroke. Frame #12: The swimmer is rotated on her right side. This attitude positions the right arm for a very strong and effective pull using the whole arm surface. Frame #13: The power of the right arm pull creates so much drag turbulence that what is happening with the arm is obscured. The left leg kick produces a force that begins the rotation of the hips back to the other side and counterbalances the entry of the right arm. Frame #14: The right arm is about to enter. The depth of the right arm in the latter stage of this stroke is not as deep as that attained by the left arm. The stroke phase is about to recommence. 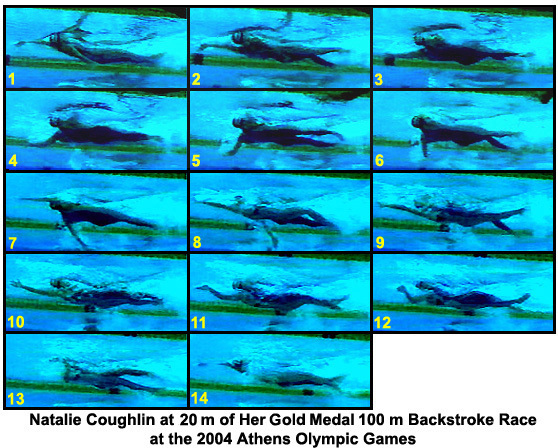 Natalie Coughlin's kick is not unusually deep. That is a good feature particularly in light of recent research that has shown that big kicks do increase propulsion but with a disproportionately greater increase in drag force. Another unusual feature is that Ms. Coughlin uses a four-beat kick rather than the "traditional" six-beat action. Each arm action involves the total arm. The pull starts well behind the swimmer and uses every segment to create a propelling surface. Other analyses will have to be performed to evaluate if the asymmetry of the inward sculling action at the end of the pulls is a consistent phenomenon. One has to wonder if an attempt to correct the total body alignment would improve this swimmer. With the buttocks being much lower than the shoulders, there is the specter of an unnecessarily large frontal cross-sectional area that would cause greater frontal drag resistance. However, in some athletes, focusing on a perfect streamline could reduce the power of the arm pulls because they would be taken out positions that are necessary to create optimal forces. With Ms Coughlin's pulling actions, great forces are created. Disruptions to force generation by the arms should always be considered before altering this stroke.